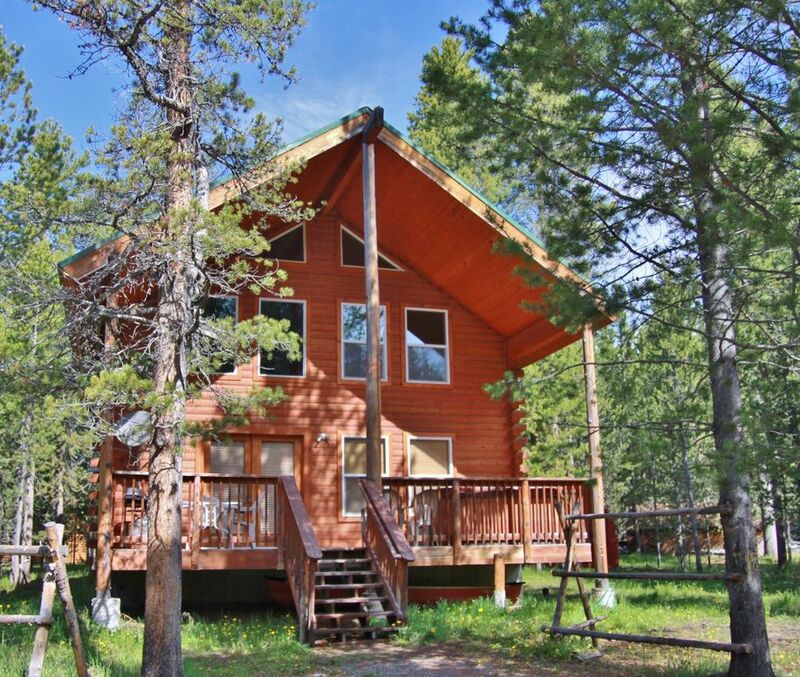 This is a comfortable log cabin with a great hot tub, walking distance to the Island Park Reservoir. It is 32 miles to West Yellowstone, about a 40 minute drive. Enjoy the sound of the wind blowing through the pine and aspen trees while you relax in the hot tub. A peaceful and quiet retreat to get away from life for a few days. -Three bedrooms, each with queen bed. Each bedroom has a door that locks, window and a closet. They are real bedrooms. The Cowan cabin can sleep a maximum of 8 guests including all children. We provide linens and pillows for the hideabed. These items are stored in the main floor hallway closet. Please note: We do not have our own boat dock. You can use the private boat launch for the Cowan subdivision but will not have access to a boat dock with this rental cabin. You are required to remove all of your garbage when you leave even if the Island Park landfill is closed on your chosen departure date. The Saint Anthony transfer station is 45 minutes to one hour south on Highway 20 and is open on the days the Island Park Landfill is closed. No charge at either location. Bags are provided. Your security deposit will automatically be deducted for $100.00 If you leave any garbage at the cabin. We have no control over what days the landfill is closed or over what days renters chose to depart. Sorry, there is no garbage service in Island Park. We own vacation rental property in Idaho and Utah. We enjoy helping clients plan their trips and explore the Island Park area. Island Park is the best of the Yellowstone area without all the tourists. All of my cabins have large lots surrounded by trees for a private and peaceful vacation. There is great hiking and fishing in the summer and incredible snowmobiling and cross country skiing in the winter. There is also a golf course if you want to hit a few balls in the summer. Harriman State Park is close by with the best hiking and cross country ski trails in Eastern Idaho. We like to paddle in the canoe in the Island Park resevoir. We also take our speed boat out and go fishing and waterskiing. This cabin is full log construction and really has the cozy cabin in the mountains feel to it. After playing on the water it's nice to throw a steak on the grill (or a fish if we were lucky that day), and then relax in the hot tub. In the winter, sometimes it's just nice to watch the snow fall while you read a book by the gas fireplace, or go sledding or cross country skiing. Island Park was just like the description said “ perfect log cabin for a family getaway”. We had an amazing time in this cozy cabin. All the snow was cleared off the roads for our arrival. My family and I were able to rent sleds and drive them all the way to the cabin, it was a blast. We would love to return to this place during the summer months to experience what that has to offer. Overall, I would recommend this place to all my friends and family. We have over 40 five star reviews for this cabin ,but we understand he is entitled to his opinion. At the end of his review he says "there is no reason not to stay there , cabin is just fine" ? So why did he give it only two stars? Please let me address his concerns. Blood trail? We have had two renters since him and nobody has mentioned this to me or the manager? I will have maintenance repair the holes in the deck overhang. No renter has ever reported any mice or bats in the cabin. I have a ZERO tolerance policy for vermin. Those holes will be fixed as soon as current renter leaves. The hot tub is not new, but it works great. We agree it is time to upgrade the couch and loveseat and will do so before the busy summer season. Was a nice cabin. Parking was a little tight with truck and sled trailer. But there was plenty of good snow. Annual sled trip for three couples. We really enjoyed the hot tub. Kitchen had everything to cook with and even had a large crockpot. The cabin was easy to find, driveway and roads plowed. Great place..we will be back next winter. Cabin was great. Check in was easy with lockbox by the door. Comfy beds, nice towels, everything was super clean. We really liked the hot tub and that the wifi worked fast. Owner was quick to respond to any questions we had and gave us an early check in and late check out. Nice place for our group of six sledheads. It has a great hot tub. It was easy to find, everything was clean and as advertised. It was really close to great sled trails but we had quiet and privacy at the end of the day. We would come back. Holidays except Christmas and New Years which have their own rates listed, are $25.00 more per night. Holidays include Presidents Day, Memorial Day, July 4, Labor Day and Thanksgiving. Holiday rate applies the day of Holiday and two days before and after. 60 day cancellation policy required for refund of rental deposit. Final payment is due 30 days prior to arrival. No refund is issued for rental deposit or final payment if you cancel within 30 days of your arrival date. 8% Idaho sales and lodging tax is not included in the nightly rate Nonrefundable cleaning fee of $75.00 is not included in the nightly rate. Visa or Mastercard required at booking for rental deposit which is half the total 60 day cancellation policy and final balance due thirty days prior to arrival. No refund of rental deposit is issued if you cancel within 60 days of your arrival date. No refund of any kind is issued if you cancel within 30 days of your arrival date unless we can rebook. If we can rebook, your final payment is refunded but rental deposit is nonrefundable.